This upscale, Mediterranean-inspired resort is 4 miles from the Chardonnay Golf Club and the Napa Valley Opera House, and 5 miles from Downtown. Featuring Tuscan-style decor and marble bathrooms, the refined rooms have flat-screen TVs, minifridges and coffeemakers. Upgraded rooms offer balconies. Plush suites add kitchens and patios. Amenities include a high-end wine bar, a trendy Italian/Californian restaurant and a lively lounge with 6 bowling lanes. There’s also a wine-tasting room and a chic spa set in a cave with natural stone and copper accents. A resort fee covers Wi-Fi, a local shuttle, use of a gym, 2 pools and 3 hot tubs. Less than 1 mile from the William Hill Estate Winery, this upscale resort is 4.4 miles from the Napa Valley Opera House. The chic, modern rooms, suites and cottages are spread around the resort; some are private and gated. They feature private balconies, full kitchens, separate living areas and fireplaces, plus private pools and tennis courts, and Wi-Fi access. There are to 2 championship golf courses. The spa offers health and beauty treatments. Other amenities include an outdoor pool and tennis courts. There’s also a grill restaurant and a cocktail bar serving light snacks, as well as meeting space. Complimentary wine tastings are offered. Set in a cluster of buildings on 2 acres of vineyards and trees, this high-end hotel off State Route 29 is 5 miles from downtown Yountville. Refined, antiques-filled rooms in an 1870s house feature free Wi-Fi, flat-screen TVs with DVD players, marble bathrooms and sitting areas. Upgraded, modern rooms add fireplaces, and some also have kitchenettes. Plush suites add balconies, and bathrooms with heated floors and soaking tubs. In-room spa treatments are available. Continental breakfast, and evening wine and cheese are complimentary. There’s a spa, an outdoor pool and a hot tub, as well as grounds with contemporary sculptures and ponds. This Mediterranean-style hotel is 1.1 mile from the Napa Valley Opera House and 1.2 miles from the Napa Valley Wine Train. Modern suites have flat-screen TVs and WiFi (fee), plus separate living areas with pull-out sofas, kitchenettes and coffeemakers. Upgraded suites include a bottle of wine, free WiFi, a galley kitchen and/or garden views. Free made-to-order breakfast is offered daily, as well as evening appetizers and drinks. There’s also a restaurant, a fitness center and 2 pools, plus a business center and 10,000 sq ft of meeting space. This upscale hotel is a 5-minute walk from the Napa Valley Opera House, an 11-minute walk from the Oxbow Public Market and 8 miles from the Hess Collection. The hip rooms and suites with hardwood floors feature 42-inch flat-screen TVs, coffeemakers and nonalcoholic minibars. Some suites have loft bedrooms, glass fireplaces and balconies. Free perks include Wi-Fi, regular wine tastings, self-parking and access to an adjacent fitness center. There’s also a barista bar, a regional restaurant and a cocktail bar, plus an outdoor terrace with fire pits. 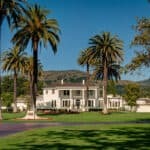 Surrounded by Napa Valley vineyards, this upscale, 157-acre resort is 6 miles from the Old Faithful Geyser of California. Elegant cedar-sided lodges with floor-to-ceiling windows feature free Wi-Fi, entertainment centers, and outdoor living rooms with fireplaces and rain showers. The 1- and 2-bedroom upgrades add wet bars and kitchens. In-room dining is offered. There’s a private lake and a vineyard, as well as a gym, an outdoor pool, a wine cave and an indoor/outdoor spa (fee). Wine seminars and art classes are offered. A restaurant offers lake views and a deck, and there’s a casual poolside eatery and a lounge bar. Set in a modest low-rise building, this relaxed hotel is a mile from the Napa Valley Wine Train and the art deco Uptown Theater, and 7 miles from the Artesa Vineyards & Winery. Featuring exterior entrances, the warmly decorated rooms come with free Wi-Fi, cable TV, minifridges and microwaves. Upgraded rooms add hand-painted murals, chandeliers and whirlpool tubs. Amenities include a garden and free parking. This traditional inn is less than a mile from the Napa Valley Opera House and 1.3 miles from vineyard tours with the Napa Valley Wine Train. All of the warm rooms offer free WiFi, flat-screen TVs, desks, minifridges and coffeemakers. Some rooms have fireplaces. Children 12 and under stay free with a parent. There’s a free continental breakfast buffet, afternoon tea service and parking, as well as an outdoor hot tub, a spa and a garden. Amenities also include a guest computer, a meeting room and laundry service. This modern hotel and spa surrounding a lagoon in suburban Napa Valley is 7 minutes’ drive from Six Flags theme park and 12 minutes’ drive from Napa County Airport. All rooms offer classic decor and custom-designed beds, plus flat-screen TVs and free WiFi. Suites add separate living areas. Some rooms offer balconies/patios and lagoon views. A stylish all-day restaurant focuses on locally-sourced produce and features an extensive local wine list. There’s also a full-service spa, fitness center and outdoor pool. Additional amenities include 5 meeting rooms and a business center, plus free parking. Set on 8 acres of vineyards, this upscale resort is 1.1 miles from Downtown and 8.4 miles from the restaurants and shops of Yountville. The rustic-chic rooms, suites and cottages are equipped with free Wi-Fi and flat-screen TVs. They offer views of the gardens, vineyards or the Mayacamas Mountains. Some have fireplaces, separate sitting areas, whirlpool tubs and private decks. There are 2 heated outdoor pools (1 is adults-only) and 2 hot tubs, an exercise room and meeting space. There are spa treatments (fee), plus access to a golf club and cigar program (fee). Set on 3 acres overlooking the Napa River, this refined hotel is 1 mile from wineries along the Silverado Trail and 2 miles from the Uptown Theatre. The 12 elegant rooms feature free Wi-Fi, 42-inch flat-screen TVs and minibars, as well as whirlpool tubs and designer toiletries. Most are adults-only, and some have gas fireplaces and river views. Upgraded rooms add sitting areas, and some have private terraces or decks. Gourmet breakfast and evening wine receptions are included, as are passes to a nearby gym. A spa with a seasonal riverside cabana offers massages and beauty treatments. Children 17 and under are welcome with prior notice. This classic inn is 3.4 miles from downtown Napa and 5.6 miles from Yountville. The warmly furnished rooms are equipped with coffeemakers, flat-screen TVs and free Wi-Fi. Suites add features like private patios, whirlpool tubs or living areas. Free perks include hot breakfast, nightly wine tasting and parking. Amenities also include an outdoor pool, a whirlpool tub and meeting facilities. Dating from 1901, this elegant hotel within the 19th-century Historic Napa Mill is 2 minutes’ walk from the Napa River and a 6-minute walk from live shows at Uptown Theatre. The plush, ornate rooms, some with Victorian-style furnishings, feature claw-foot tubs, coffeemakers and minifridges. They also include flat-screen TVs, free Wi-Fi and iPod docks, as well as complimentary breakfast. Suites add sitting areas, fireplaces, and/or balconies with river views. Parking, local tours and wine-tasting sessions are offered at no charge. There’s also a spa, a market and a wine shop, plus 3 meeting rooms, event space and a riverfront patio. This modest, wine-country hotel set among Old Town Napa’s shops, restaurants and galleries is 5 minutes from the Napa River Trail and the Italianate-style Napa Valley Opera House, which dates to 1880. Accessed by exterior corridors, the cozy rooms have sturdy wood furnishings and dark-colored accent walls, and offer free Wi-Fi, cable TV and coffeemakers, plus bathrooms with marble vanities and Swedish massage showers. Some suites add whirlpool tubs and full kitchens. Extended stays are available. Complimentary perks include coffee, tea and parking. There’s also an outdoor pool. Off the St. Helena Highway (Highway 29), this simple budget lodging is 2.3 miles from Napa Premium Outlets, 2.7 miles from the Napa Valley Wine Train and 5.8 miles from Skyline Wilderness Park. The straightforward rooms include free WiFi and TVs with expanded cable channels. Kids 17 and under stay free with an adult family member. There’s a seasonal outdoor heated pool in addition to free morning coffee and parking. Set on a hillside in the Stags Leap District, this upscale hotel is a 12-minute walk from Cliff Lede Vineyards and an 18-minute drive from downtown Napa. Elegant rooms have private balconies, fireplaces, and marble bathrooms with soaking tubs and rainfall showerheads. They all include free Wi-Fi, flat-screen TVs and iPod docks. Suites add separate living spaces. Amenities include a complimentary 3-course breakfast, an outdoor pool and a hot tub. Spa services are available for a fee. Overlooking the Napa River, this upscale hotel is a 4-minute walk from the Napa Valley Wine Train, and 12 minutes’ walk from downtown Napa’s antique stores, wine-tasting rooms and gourmet restaurants. The stylish rooms come with flat-screen TVs and free Wi-Fi, while upgraded rooms offer whirlpool baths, pull-out sofas, and balconies with river views. Room service and in-room spa treatments are offered. There’s an elegant wood-paneled bar, and a restaurant with a patio, plus an exercise room and bike rentals. Meeting space is available. Surrounded by vineyards and wineries, this upscale inn off US-29 in the Napa Valley is 4 miles from Lake Hennessey and 9 miles from the Silverado Trail. Featuring exposed-beam ceilings, the cozy, chalet-style rooms have free Wi-Fi, flat-screen TVs and minifridges, and tea and coffeemakers. All offer patios, and living areas with fireplaces. Some rooms are split-level. Suites include separate living spaces, Juliet balconies and spa-style bathrooms. Parking, continental breakfast, and weekly socials with wine and cheese are included. There’s also an outdoor pool, a hot tub, and a terrace with a stone fireplace. Minimum-stay rules may apply. 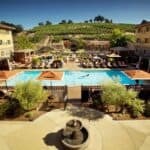 Set on the outskirts of historic Calistoga, this upscale resort is 4 miles from Castello di Amorosa castel and winery and 7.6 miles from the Robert Louis Stevenson State Park. Chic studio rooms and suites are set in wooden cottages and come with vaulted ceilings and minibars, plus flat-screen TVs, iPod docks and free high-speed Internet. Resort bicycles are also provided. Some quarters feature fireplaces, patios and outdoor hot tubs. There’s a restaurant serving an organic farm-to-table menu, along with a patio lounge. Amenities include yoga classes, mud baths, and a hot-springs mineral pool. Located on the riverbank in downtown Napa, this upscale hotel is 3 minutes’ walk from the Napa Valley Wine Train which offers vineyard tours. Rooms have flat-screen TVs, desks and free WiFi, as well as rainfall showers and pillow-top mattresses. Upgraded rooms offer kitchenettes. Suites add living rooms, pull-out sofas, kitchens and balconies. Dogs receive beds, treats and toys (fee). Parking is free. Culinary options include an acclaimed French restaurant, a bar and a lounge. Other perks are a fitness center, a spa, and an outdoor saltwater pool with a bar and hot tub. There’s also a business center with 5 meeting rooms. Just off Highway 29, this low-rise, 1950s-style motel once visited by Marilyn Monroe, Rock Hudson and Elvis Presley is 2 miles from downtown Napa and the Napa Valley Wine Train, and within 5 miles of dozens of wineries. It’s also 14 miles from the Hess Collection art museum and Six Flags Discovery Kingdom. Traditional, pool-view rooms accessed by exterior corridors offer low-key decor, free Wi-Fi and satellite TV, plus coffeemakers, microwaves and minifridges. Complimentary amenities include on-site parking and continental breakfast with fresh fruit. The heated courtyard pool features mountain views, and there’s a lawn with a barbecue area. Napa Valley is home to some 400 wineries from the large conglomerate to the small producers of just a few hundred cases. Because of the warm growing season and the absence of excessive moisture through the harvest, that small berry with a thick skin is perfect to make those intense wines, full of character and flavor. Cabernet Sauvignon holds honor in Napas wine-making history. Talented winemakers from all over the world have come to turn this little berry into worldclass wines. Bell Winery Bell Winery Bell Winery was established in 1991 by Anthony Bell. He began his venture with a grape called the “Jackson Clone” which is now referred as “Clone 6”. With the help of investors he has grown his 500 case production to over 15,000 cases a year. The special attention of the knowledgeable staff and the great cabs produced with the now famous “Clone 6” make this a must do stop when you come to Napa. Clos Du Val Clos Du Val Winery is in the Stags Leap District of Napa Valley. John Goelet and Bernard Portet wanted to produce Bordeaux-style wine and found Stag’s Leap to be perfect place to establish their winery. They bought 150 acres to establish the winery in 1972. To add to the Bourdeax style wines they bought vineyard land in Los Carneros. The cooler climate of this region was optimal for the Burgundian varieties, like Pinot noir and Chardonnay. Clos Du Val Bennett Lane Winery has become known for the well textured Cabernet Sauvignon it produces. Their Maximus Cabernet has been touted by publications like Wine Spectator, Wine Enthusiast and Robert Parker. The ratings for several vintages have been in the 90+ range for those who like to know the score. They also make a wonderful Merlot and the Syrah has also gotten recognition. This is a warm cozy place tucked just north of Calistoga, well off the beaten path. Madonna Estate Since 1922 the Bartolucci Family has consistently grown and harvested grapes at Madonna Estate. Located in the Carneros region, an area known for its terroir of rich soil and cool breezes, the Bartolucci family organically farms their grapes and produces Estate Bottled wines. In addition to practicing natural farming methods, they also combine traditional and modern winemaking techniques. They are the third oldest winemaking family in the Napa Valley. Frogs Leap Winery Jessup Cellars is known for handcrafted, small production wines and offers an exceptional tasting experience. They have a tasting room just down the street from the French Laundry and it’s gardens. The winery is eco-friendly down to the water which is purified through filters on the property. The expertise and individual attention of the Jessup team are unmatched. Your wine tasting will include bold cabernets, smooth Bordeaux– style blends, crisp whites and rich Ports. Grgich Hills Grgich Hills Miljenko “Mike” Grgich gained international recognition at the “Paris Tasting” of 1976. This blind tasting was lead by a panel of eminent French judges who tasted white Burgundies of France and a few Chardonnays from the Napa Valley. Napa Valley wines came out on top which surprised the French judges. The 1973 Chateau Montelena Chardonnay became the finest white wine in the world. This launched Mike’ reputation as one of the greatest winemakers in the world. Andretti Winery All are welcomed at the award-winning Andretti Winery. Located in the legendary Napa Valley, Andretti Winery spouts old world charm and pours the finest wine for its patrons. This “Italian village”, was modeled by the boyhood memory of Mario Andretti, the finest race car driver of all time. Founded in 1996 and lead by Joe Antonini, Andretti Winery is dedicated to celebrating the Italian lifestyle, famous for it’s food and wine culture. They grow premium grapes and produce an array of great wines. Tarla Grill This long awaited Mediterranean style grill, Tarla, offers a simple yet sophisticated menu of Greek and Turkish Fusion Cuisine. Modern decor with a dining bar is flanked by bistro syle tables in a comfortable and elegant space. Their Kebobs and eggplant Musakka lead with golden stars but are not the only prizes at this tasty outpost of Europe and the Middle East. Try a lamb burger, Pastachio crusted fish, braised ribs complemented by hummus, dolmas and tzatzitki. Napa General Store Napa General Store The café offers casual riverside dining in a relaxed atmosphere. For breakfast try some cornmeal pancakes with thick-cut bacon, chocolate-filled beignets, huevos rancheros and fresh local coffee. Lunch is house-made soups, locally grown salads, monstrous sandwiches, sublime brick-oven pizzas, and tasty Asian-styled noodle bowls. They offer breakfast and lunch daily (open 8am-4pm) on their garden patio or by a cozy wood-stove, the Napa General Store also offers wine tastings and sales from unique small-production Napa wineries along with a barn-full of local artisans and American made gifts. Risorante Allegria With an expansive Italian menu is perfect for a luncheon or a fancy dinner. The full bar draws a good crowd and spings a great energy to the restaurant. They have wonderful appetizers and a select wine list. On main street near all the nightlife they offer a fine dining experience. The white table cloths host the Italian and Mediterranean classic dishes. The service is top shelf supported by candlelight and Italian music. Come here and they promise great memories and great food. Cole’s Chophouse Cole’s Chop House is a “Classic American Steak House” located in historic downtown Napa. They serve only the best: 21 day dry-aged prime steaks, Certified Angus Beef, formula fed veal, New Zealand lamb and fresh seafood. Try the wispy onion pre plate. The staff sommelier can help with the extensive wine list, of course, emphasizing Napa Valley Cabernet Sauvignon from the area’s finest producers. This establishment is a favorite with locals, an elegant “boothy” style with the best of food and wine available. To top it off the bar offers top shelve top serve. Panchas The “original” bar of Yountville, Pancha’s opened in the spring of 1982 and was awarded “dive” status in 1983. Ever since it has entertained a ‘divergent crowd. Mercedes or Suburu, Harley or Schwinn…all are welcomed in. They serve fermented beverages of all specialties while Taco Truck Garcia feeds the hungry in the adjacent parking lot. Pool is provided for those who like to play. IDs and attitudes will be checked. Open daily 12 pm to 2 am. Dive in…. They are located in Napa’s Historic Mill the back door opens to a patio on the river. The place will remind customers of a a speakeasy of the past. On Fridays & Saturdays live entertainment is served with drinks and appetizers. They serve a full bar and microbrews on tap. This is Napa’s Premiere Music Room. Live jazz, smooth jazz, blues, rock, reggae and motown music. Set among seven acres of spectacular gardens filled with designer sculpture, MacArthur Place is a luxurious hotel and spa located just 4 blocks from the Sonoma Plaza and convenient to both Sonoma Valley and Napa Valley wineries. Saddles, the restaurant at MacArthur Place is consistently named the wine country’s best steakhouse. Come relax with the quiet pace and beautiful scenery. Enjoy the delicious food and wine in Sonoma Valley. The climate is temperate year round, this is a wonderful place to explore in every season. The Inn is located near the Sonoma plaza, a great destination for food and shopping. The inn has 19 well-appointed guestrooms, each with fireplace and a flat screen TV. Most rooms sport a patio deck and the Inn provides bikes for your riding pleasure. Lodge at Sonoma The Lodge at Sonoma Renaissance Resort & Spa is a wonderful place to stay. Showcasing the incredible beauty of the valley, this Sonoma spa resort mixes artisan surroundings within the hotel grounds to create a casual but elegant environment. The world class Raindance Spa offers the best of the four R’s revitalization, relaxation, reflection and romance. Spend some time at the award-winning Carneros Bistro & Wine Bar featuring local wines and clever cuisine Mediterranean style. The Vintners Inn is a four-diamond 44-room luxury hotel conveniently located in the heart of Sonoma. The Inn is surrounded by 92 acres of lush vineyards and its grounds is layered in flowers with courtyards and fountains. There are lots of activities and adventures—available right there at the inn and plenty of shopping close by. Sonoma County is one of those special places for growing world-class grapes. It is beautiful and resource-rich: drawing some of the best winemakers and culinary experts on the planet. Let us take you there on a wine tasting adventure. You’ll experience the hidden boutique wineries and maybe have a picnic overlooking the vineyard. From the rolling hills to the giant redwoods, Sonoma Valley offers amazing beauty to complement it’s food and wine. Laid back is the prevailing attitude making your visit relaxed and welcoming. Sonoma’s 13 appellations offers many hidden wineries. Try an appellation tour to discover it’s history and terrior. We have limousines, limo vans and suv’s to get you there. Jacuzzi Winery Jacuzzi Winery Located in the famous Carneros appellation, Jacuzzi Winery is set among the rolling hills of the region. In an effort to be organic, Jacuzzi Family Vineyards farms the “Green String” way; naturally and sustainably. The stone building is ‘villa style’, the tasting salon opens up to an expansive inner courtyard with beautiful gardens. They specialize in Italian varientals like Pinot Grigio and Sangiovese. The ‘The Olive Press’ features many olive oils to taste in both domestic and european styles. Robledo Family Winery Robledo Family Winery Every bottle produced at Robledo Family is a labor of love; love for family, farming and fermentation. Reynaldo Robledo began as an immigrant field worker worked himself into a very successful vineyard consultant in California. He took those same skills as a viticulturist and knowledge of grape culture as the foundation for Robledo Family Winery. His children and his grandchildren share in his passion and produce some of the best wine Sonoma has to offer. Russian River Vineyards The famed Russian River Valley, visited by fog and anchored by volcanic soils is home to some of the world’s finest vineyards. Consistently producing distinctive, highly praised wines; It is the heart of this renowned wine growing region. Picturesque and historic Russian River Vineyards isone of the valley’s oldest and most storied wineries in Sonoma. The estate was recenyly transformed into a modern-day archetype of an organic, sustainable and “green” winery. Their Pinot Noir is one of the best in the valley. Frogs Leap Winery Lancaster Estate is a beautiful vineyard in the Healdsburg secluded hills. All their wines are Estate grown, bottled and produced. Their commitment that the wines produced consistently retain a definitive richness of character; deep, black fruit flavors and attractive aromatic notes of lavender and mint. Read reviews of our wines, they have quite a rich following. Lancaster Estate wines are produced in limited lots. They invite you to visit do a wine tasting you will always remember. El Dorado Kitchen Set in the El Dorado Hotel in the heart of downtown Sonoma, El Dorado Kitchen blends sophisticated urban style with a relaxed wine-country spirit in a setting that is at once simple and dramatic, contemporary and comfortable. Here you’ll be treated to superb contemporary California cuisine featuring farm-driven seasonal ingredients. The restaurant offers a stunning stone courtyard for outside dining, a relaxing lounge with a fireplace for cocktails, and an inviting private dining room for the ultimate intimate gathering. El Dorado Kitchen is open for lunch and dinner daily. Cork’s Corks @ Russian River Vineyards is the only winery-based restaurant in the Russian River Valley, offering an unparalleled wine country dining experience in an historic 1890s farmhouse. The creative cuisine is especially tailored to match the stellar wines of Russian River Vineyards. Executive Chef Todd Davies, named in “Bay Area’s Top Ten Up-And-Coming Chefs”, and most recently Executive Chef at mc² in San Francisco, creates dishes that complement the quality evident in our award-winning wines. John Ash Restaurant A visit to the legendary John Ash & Co. restaurant is a celebration of wine country cuisine at its best. Nestled next to the spectacular Vintners Inn, with its 92 acres of lush vineyards and landscaped gardens, John Ash & Co. was the first Sonoma County restaurant to introduce the concept of cooking seasonally with fresh, local foods and produce—and pairing these exceptional recipes with wines from the region. The following is a listing of some of our favorite Sonoma Valley restaurants. Be assured that epicurean delights are abundant in any of our world class restaurants. For many years, though thousands flocked to exhibits in the United States and around the world to see the work of Charles M. Schulz and his original comic strips. As the 50th anniversary of Peanuts drew closer, it seemed clear that there must be a museum, but Schulz (Sparky to family and friends), resisted being “a museum piece.” The vision for the Museum was driven by the desire to show how Schulz’s work inspired, healed, and taught us all what it means to be part of the human family. Sonoma Plaza Sonoma Plaza, a National Historic Landmark, represents several important events in California’s history. On July 4, 1824, Mission San Francisco Solano de Sonoma, the last of 21 missions, was founded by Father Jose Altimira and the only adobe mission established during the Mexican period. The Pueblo at Sonoma was established in 1835 by General Mariano Guadalupe Vallejo, Military Commander and Director of the Northern Frontier for the Mexican government. In June 1846, a party of settlers occupied Sonoma Plaza, proclaimed a Republic of California, and raised the Bear Flag. The new republic and declared independence from Mexico. In 1846, the Bear Flag was replaced by the U.S. flag. Infineon Raceway The 1,600-acre facility serves as the gateway to the beautiful Sonoma Wine Country. The seven-race major event schedule, one of the most comprehensive in the country, will be highlighted by three of the top racing series in the country – the NASCAR Sprint Cup Series, NHRA Full Throttle Drag Racing Series and IZOD IndyCar® Series. In addition to its slate of major events, Infineon Raceway is a year-round motorsports complex with events scheduled 340 days and 50 weekends a year. More than one-half million fans pass through the gates each year.